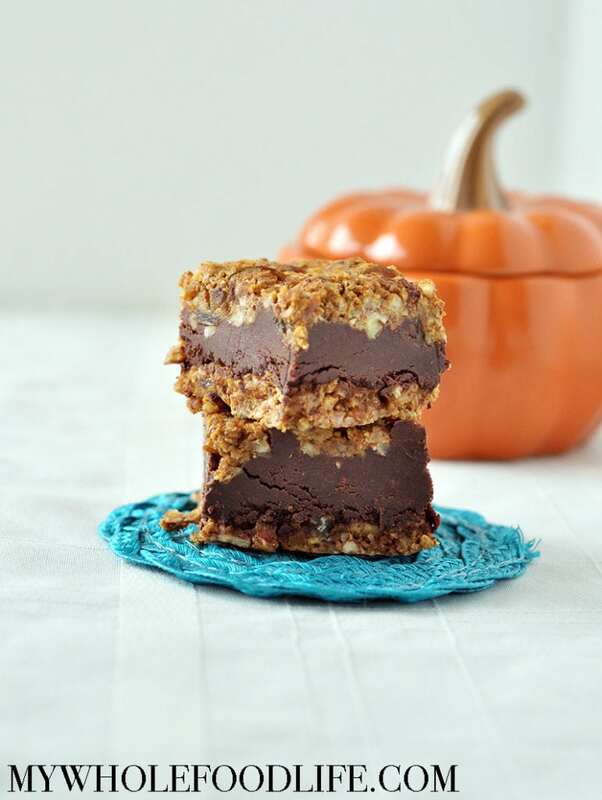 Pumpkin Chocolate Bars that are vegan, paleo and gluten free. My favorite time of year is here! Do you love fall too? Pumpkin on all the things! I am starting with these delectable pumpkin bars. These healthy bars were inspired by this amazing recipe on Pinch of Yum. As soon as I saw her recipe, I thought about making a pumpkin version. It came out great! Another great thing about these bars is that they contain no re-fined sugars. They also require no cooking at all! Score! These dessert bars are very rich and you only need a little bit to feel satisfied. I hope you enjoy them as much as I did. Spicy pumpkin pecan crust with a layer of chocolate ganache in the middle! Line an 8x8 glass baking dish with parchment paper. Pour the chocolate mixture over the first pumpkin layer. Freeze again for 5-10 minutes. Once chilled, cut into bars and serve. Enjoy! We made this recipe this evening for a little treat and that it was! Great recipe, thanks!